The pic below was taken just after the Wednesday Post’s pic! Ray’s feet and “rear” are clearly immune to cold temperatures as he quite happily stands still, or sits, in the snow when requested to do so. While this cooperation is appreciated, he does sometimes sit down simply because he does not want to go in the direction that we are going. He has always had a little “stubborn streak” in him, and almost 80lbs of motionless dog (with feet stretched out in front to brace himself against us) can be a bit of a challenge. How do we move him against his apparent will? There are quite a few options, none of which will consistently work, but one of them at any given time will be just what is necessary to change his focus. A tug on the leash can work, but not too often. One of us walking on ahead and going out of sight can work. Ray seems to like to know where we are going and so telling him will usually work, as long as it is a place that he knows is good for him. Telling him we’re going to Lululemon, and then heading in a different direction does not work! He will often “stand” upon request, and then walk with us, but he expects his treat for standing upon request. There are occasions when we will just stand still, and wait for him to decide that sitting at that particular spot gets him nowhere (not much fun this time of year with an arctic blast passing through)! His apparent desire to simply go in a different direction (it is his walk after all!) will occasionally be accommodated.. We will let him lead and see where he takes us, but that really depends on what we see as his potential options, and whether we want him to go there! It was reassuring to read that I am not the only one to experience a motionless dog. Sometimes, I can convince Bailey to come along if I use a high pitch voice and start to skip/jog. I think she believes that I am having fun without her and just has to join me in the frolic! Agreed … but let’s not tell Ray! Ray is like my Lena; he has a mind of his own. Personally, I like a dog that has its own ideas about things. The thought of a subservient and submissive dog is rather sad. True. I wanted a cat with personality. Certainly got it in spades when I picked Lena. Those dog paw plants can make life interesting especially when you’re moving alone at a clip and then all of the sudden, screeching to dead halt. Your experience made me laugh and reminded me of Sam. Yes I can imagine that Sam would have a mind of his own at times! That’s a bit of an understatement! And I was being equally sarcastic. Because we all know Sam is a knucklehead. We will often just try and “wait him out” but, when it is bitterly cold, we often switch to an alternative strategy! Have you ever succeeded? I never have. It’s me who gets bored and gives in. Yes… and often! Ray knows what “stand” means, so that will sometimes get him off his rear. He is very attached to us so, if one of us goes out of sight, he will sometimes get up and try and find the missing pack member. He understands “the bank”, “Lululemon”, “the mail box”, and a number of other destinations where he generally gets treats, so telling him where we are going will often work. Finally, while he may not want to go in our direction, he usually does have an agenda, so we let him pick the direction. Once he is up and moving, we can often turn him around …. or simply let him take us on a walk. We have to remind ourselves that the walk is mainly for his benefit so if he picks the route now and then … so what? I like your approach in regards to “it’s his walk”. You seem to have some good strategies. It can be a sensitive area, and if you have been bribing him, then you should not be surprised when he tries to manipulate you. It’s the most natural thing for him to do! You should be trying to show him that cooperating is beneficial to him i.e. reward based training. 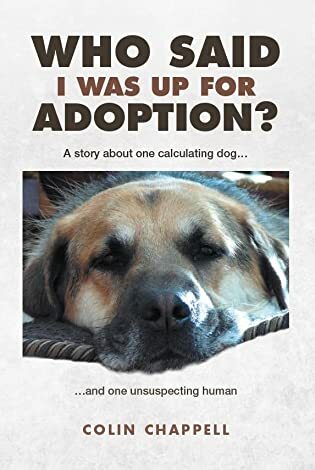 Our training of Ray in many areas is covered in my book about his first 18 months with us – “Who Said I was up for Adoption?” (available from Friesen Press, amazon etc. in eBook, paperback and hard cover formats). Please give it some thought as I suspect you will relate to many of our challenges. They can read our body language far better than us reading theirs. It is fun trying to stay ahead of things! They communicate quite effectively, but only if we know what to look for etc. Ray must have been quite frustrated with us for quite a while as we totally missed his “signals”! I’m very stubborn, but my patience is not my best suit… working on it. Yup! Work on it! He will work you anyway he can. That’s just a survival skill! I don’t currently have one. Just speaking from past experience. And learning for the future. Ray certainly does have a mind of his own (and a size to help make his dreams/desires come true)! He too was a stray and estimated at 2 years old when picked up. He sniffs everywhere as well, but that is typical dog behavior . Whereas we analyze things by sight before the other senses kick-in, dogs are guided by scent with vision etc. being secondary. Also note that scenting is very demanding on a dog so let him scent away as it will tire him out! Ray was afraid of people and other dogs, and has been seen stalking a black garbage bag blowing in the wind, and a feather! We cannot do much about garbage bags and feathers so he must learn by himself that they are not out to get him, but we can (and did) convince him that other people and dogs were not necessarily a threat to him. We had to use a professional trainer to get started on that, but Ray is now Mr. Social with everybody. It was not only money well spent, but a great education in dog behavior and body language. Ray was giving us some pretty obvious signals … but we weren’t getting them! I don’t understand what “acting homeless” is, but as long as Blue is happy … so what? If he is not happy, then you need to find out why and address it. Ray has a good command on the English language. A treat in hand often encourages cooperation, as you well know! I see you still have tons of that glorious white stuff. I know exactly what you’re talking about. He becomes an immovable object. Makes me feel cold and appreciative of the February sunshine! Likewise. Our clocks will go forward and we should have warmer climes! Of course! Don’t we all! It’s a dog’s life, eh? Animals can be very stubborn. A 15 pound cat who does not want to go to the vet is far stronger than I am! 🙂 Ray should give you a treat when you follow his instructions. He does … he is very cooperative and super nice to everybody! He even takes me to my bank, but then he gets a biscuit from the tellers so that may be a selfish move on his part! Ray has his own mind, eh! Makes me laugh at how he won’t let you take him in the opposite direction if you say you are going to Lululemon. Never knew a dog with such a sense of direction. If you remember from his book, he once took me for on very long walk, across a school field and around the back of an apartment building … so that he could get onto the road that lead to the shelter (where he came from) and visit his human friends there! He does have a very good sense of direction and smell. I do remember that now and I remember being surprised too when I read that in your book about his excellent sense of direction! Good boy, Ray, you really taught them well!